Tape libraries are about putting more capacity in less space. M5 has appeared from nowhere to leap to the top of the heap. 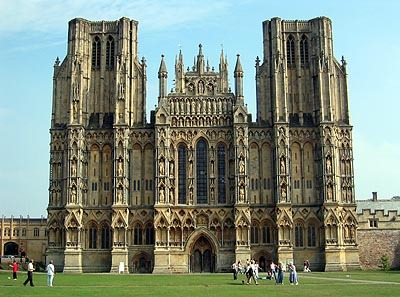 If you go down the M5 from Bristol and then head eastwards before you reach Exeter you will find Wells, a tremendous old cathedral town. The facade is crammed with features, so many that you wonder how the builders and architects fitted everything in. A tape library vendor, M5, is based in Wells and, when you look at the specs of the Richmond trio of libraries you wonder how everything is fitted in as well. - Richmond R15, 15U, 184 slots, 74TB and 7 drives. Eric Lowe, M5's sales and marketing director, was asked how on earth did his company achieve this kind of slot density? He said that, rather than concentrating on adding software added value to the library range, M5 concentrated on making the best libraries possible. It does this on a 'white box' basis with partners, such as Viglen, productising the libraries and selling them to its customers. Lowe says that libraries should hold a lot of tapes and be swift, simple and reliable in operation. It seems to me that a tape library is close to an automated container warehouse in some ways. You have slots to hold containers or cartridges and an automated picker to move catridges and containers around once they are in the library. A library has drives, three in the 6U Richmond R6 model, and these are situated at the back in a vertical stack. On the left of these is a spring to move the robot up and down between two facing rows of cartridge slots running along the sides of the library. There is a power supply, cooling fan, etc on the other side of the drives. Cartridges can be inserted in a canister, or singly through a slot. The robot slides forwards and backward along a rectangular frame and rotates on its mounting with picker arms sliding forwards and backwards to engage with the catridges. M5 has devoted a lot of attention to minimising the inter-cartridge gaps so as to increase space for catridges and reduce that for the cartridge slot supporting framework. It's also decreased the space needed for robotics by only having two motors and using the spring mechanism for lifting the the horizontal, picker-carrying frame. Clearly M5's ability to pack slots into rack space enclosures is exemplary. M5 libraries can be controlled by button pressing with status indicated on a small screen at the top right front of the unit. The vaious models can be stacked one on the other to increase total capacity. Where has the M5 team of engineers come from? From a previous company, M4, actually. M4 was bought by Quantum in 2001 and had over 40,000 libraries installed around then. Subsequently most of the team left Quantum and formed M5 in order to focus on building better library boxes. They specifically do not want to get involved in disk-to-disk backup and clever software. Their business is building the tape library component in a data protection product. M5 is an unusual tape library company. It is entering a market that has seen turmoil and consolidation. In the past year ADIC tried to buy Overland and was then acquired by Quantum. Sun acquired StorageTek and Tandem has acquired Exabyte. For a new, well, newish company in terms of its engineering team, to enter a rapidly consolidating market requires it to have a better box, a significantly better box. By focussing its R&D pound notes on the clearly defined engineering task of packing more tape capacity into a smaller space while not conceding reliability and operation simplicity, M5 has produced a simply better box. Quantum is its closest competitor in this regard. Lowe might say that Quantum has diluted its library engineering effort by looking at library management software, WORM, encryption, virtual library support and so forth. M5 has decided to do none of that. Its ethos is simplicity of focus. It will pack more tapes into a defined amount of rack space than anyone else and let its partners use this best of breed library component in constructing a data protection offering for their customers.